ALIFE is moving warehouses. And while you may be questioning how this information is relevant to you, let’s just say the folks of ALIFE decided not to move past season items to their new space, so they are clearing them out. 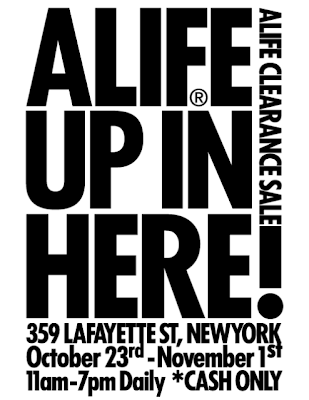 This means, for ten days starting from Oct 23rd to Nov 1st, ALIFE will be hosting a large warehouse sale on Layfayette street in NYC. They are putting a 50%-80% off tag on a great assortment of tees, apparel, footwear and accessories you might have missed out on in the past six seasons. Sure the sale goes on for ten days but we are expecting most of the sizes and good stuff to be gone by the end of this weekend, so hit that ATM get some cash ready and head on over to Layfayette between Bond and Bleecker.